In light of the unbelievable devastation Hurricane Harvey has unleashed on Houston and surrounding areas of the Texas gulf coast, Fresh Arts has compiled an "Emergency Resources for Artists" Google Spreadsheet that can be found here. The sheet includes national emergency artist grants/funding opportunities, general resource guides, local emergency response info, and links to area shelters, volunteer opportunities and more. While several resources are listed for individual artists and arts organizations, MANY of the listed resources apply to anyone in need. Need guidance on what information you need to file a FEMA Disaster Claim or a Texas Unemployment Claim? Check out this handy overview guide prepared by our friends at Avenue CDC and Harvey Arts Recovery. For a limited time, Fresh Arts is waiving membership fees for our fiscal sponsorship program to artists and arts projects affected by Hurricane Harvey, and will accelerate the application process and provide access to Fresh Arts crowdfunding platform to help artists raise money for relief and recovery as quickly as possible. Fiscal Sponsorship allows you to seek grants and solicit tax-deductible donations under Fresh Arts' exempt status. In the aftermath of Harvey, this will enable artists to access emergency funding available to aid with recovery as well as the preservation and rebuilding of your creative projects! LEARN MORE. Powered by Fresh Arts, the fund will give Texas artists the immediate help they need to rebuild. 100% of proceeds raised will be given to individual artists to help them with their immediate recovery needs, which will include everything from buying cleaning supplies, to preserving their work, to beginning the rebuilding of their studio or live/work space. Benefiting artists will apply online to receive funding, and will be selected by a jury of arts professionals based on need. We will accelerate the application process to help artists access money for relief and recovery as quickly as possible. If you are an artist interested in applying for Immediate Disaster Relief Fund for Texas Artists support, click here to apply for funding now. * For real-time updates and local news on Hurricane Harvey disaster relief, check out The City of Houston Emergency Information Center where you can also find handy links for the National Weather Service Radar, the CenterPoint Power Outage Tracker, and more. * Keep up with Road Closures & Conditions and see real-time conditions via Houston Transtar Camera Views. * Fresh Arts Emergency Resource List has an extensive list of emergency grants for artists and non-artists alike. Most notable for artists: The Craft Emergency Relief Fund (CERF+) provides emergency relief assistance including grants, no-interest loans, booth fee waivers and discounts on supplies and equipment. * The Joan Mitchell Foundation provides emergency support to visual artists working in the mediums of painting, sculpture, and/or drawing, who have suffered significant losses after natural or manmade disasters that have affected their community. * The Haven Foundation offers emergency financial assistance to safeguard and sustain the careers of established freelance artists, writers and other members of the arts and art production communities who have suffered disabilities or experienced a career-threatening illness, accident, natural disaster or personal catastrophe. 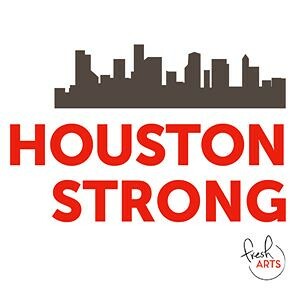 * NEW - for Houston-based Artists: Fresh Arts is waiving membership fees for our fiscal sponsorship program to eligible artists and arts projects affected by Hurricane Harvey, and will accelerate the application process to help artists raise money for relief and recovery as quickly as possible. Fiscal Sponsorship allows you to seek grants and solicit tax-deductible donations under Fresh Arts' exempt status. In the aftermath of Harvey, this will enable artists to access emergency funding available to aid with recovery as well as the preservation and rebuilding of your creative projects! To see if you're eligible and apply now, click HERE. * You don't have to be an artist to find emergency relief through FEMA's DisasterAssisance.gov where you can apply for numerous programs through a single application. Prefer to speak to someone about their emergency programs? Call 1-800-621-3362 (FEMA). Disaster assistance applicants who have a speech disability or hearing loss and use TTY, should call 1-800-462-7585 directly; for those who use 711 or Video Relay Service (VRS), call 1-800-621-3362. The toll-free telephone numbers will operate from 7 a.m. to 10 p.m. (local time) seven days a week until further notice. * Did you or a loved one lose your job because of Hurricane Harvey? Please know that you can apply for Disaster Unemployment Assistance online through the Texas Workforce Commission. Due to the impact to mail delivery, they encourage you to select direct deposit as your payment method. Feeling helpless and want to help others in need? Anyone wanting and safely able to volunteer their time at TX and LA shelters, register to become a volunteer via American Red Cross. The Red Cross is also handling volunteer logistics for numerous places including the George R. Brown Convention Center. For those specifically interested in volunteering at the GRB, first complete the easy 4-step volunteer registration process online at redcross.org/volunteer, then once cleared, check-in at GRB Hall E Red Cross volunteer desk. Parking at Hilton Americas-Houston is open and free of charge. Did you know that AirBnB has set up a Disaster Response Program where individuals can donate space for evacuees? All service fees are waived for those affected by the Hurricane Harvey disaster and checking in between August 23, 2017 and September 01, 2017. Austin Pets Alive! has been helping shelters in the direct line of Hurricane Harvey. They've been working with area shelters to transport as many pets as possible to APA. They are accepting donations of money, food and pet supplies, volunteer time, and homes for fostering pet evacuees. The SPCA of Texas seeks foster homes to help care for displaced animals: www.spca.org/foster. They also need financial donations and in-kind donations, including cat litter, litter boxes, towels, blankets, large wire crates, toys, treats, pet beds, newspaper and gas gift cards. Fresh Arts Immediate Disaster Relief Fund for Texas Artists, will give Texas artists the help they need to rebuild. 100% of proceeds raised will be given to individual artists to help them with their immediate recovery needs, which will include everything from buying cleaning supplies, to preserving their work, to beginning the rebuilding of their studio or live/work space. Mayor Sylvester Turner has established the Hurricane Harvey Relief Fund that will accept tax deductible flood relief donations for victims that have been affected by the recent floods. The fund will be housed at the Greater Houston Community Foundation, a 501(c)(3) public charity. You can also peruse hundreds of crowdfunding pages at Go Fund Me.com/HurricaneHarvey to help support individuals who have been affected by Hurricane Harvey. With millions of people affected by the ravages of Hurricane Harvey, there will inevitably be scammers and con artists looking to prey on people who have been displaced, whose homes need extensive repairs, and on the rest of us who want to help by donating to a cause that will help them. Consumerist.com has you covered with some tips on How To Avoid Scams & Fake Charities In Aftermath Of Hurricane Harvey to keep scammers at bay. There are also dozens of Hurricane Harvey Facebook groups popping providing a community forum to share resources, flood photos, and locate emergency help for themselves or loved ones. One of the largest is the FB group with over 100k members: Hurricane Harvey 2017 - Together We Will Make It; TOGETHER WE WILL REBUILD. For a comprehensive list of general and artist-specific resources visit Fresh Arts' Emergency Resources for Artists spreadsheet.